Working as photographer with many prestigious campaigns for brands such as BMW, Mercedes, Audi, Lexus, Acura, Infiniti, Chevrolet, Vodafone or Mini as well as numerous internationally awarded photography behind him, Alex always strives to remain as cutting-edge and innovative as possible and so never liked to be pigeonholed into any one particular style. 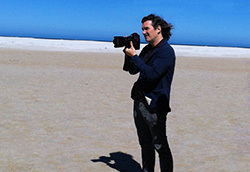 Alex is member of the Assosiation of Photography, the Art Directors Club and the D&AD. Alex shares his time between Los Angeles and Europe.